If you thought making a bold interior design statement was totally dependent on pattern, colour and size, you’d be wrong. Although a stand-out pattern, bold use of colour and size gets results, don’t underestimate the impact of white. Used in creative and interesting ways, white really delivers on the design front, especially when paired with dark, moody colours such as grey and black. 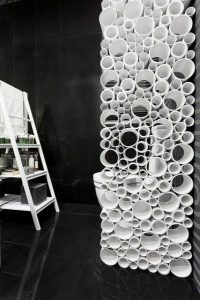 We love this effective and brilliant privacy screen idea using recycled plastic pipes. Not only does it distract from the toilet and whoever might be using it, but it creates a slice of dynamic design in white. Set against a backdrop of grey patterned wallpaper and highly-polished black floor and wall tiles, it’s the first thing the eye is drawn to when entering the bathroom. 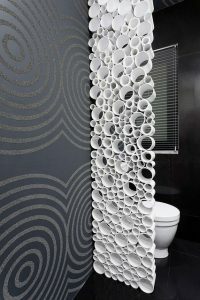 Create the look: glue cut lengths of recycled or cheap white plastic pipes of varying diameters together and secure to the wall. Create the look: keep your eyes open for interesting doors or ceiling roses in reclamation yards that can be mounted on wood to create a similar effect. Get slap-happy with the white paint and it’s job done. We’re great advocates of mixing the traditional with the modern and this bathroom certainly hits the spot. 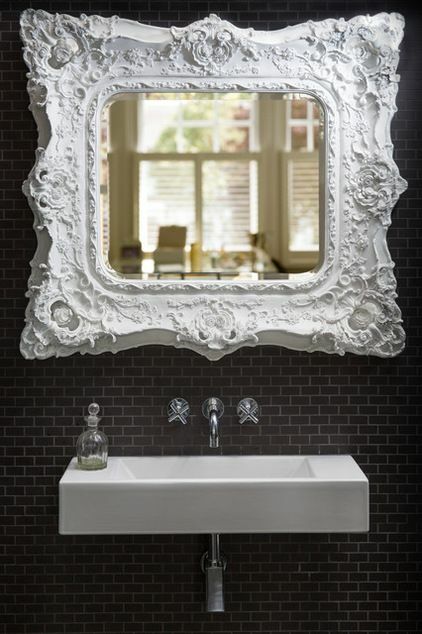 The beautiful ornate mirror really pops against the contemporary black wall tiles and sits incredibly well alongside the chunky contemporary wall-hung sink with wall-mounted taps. 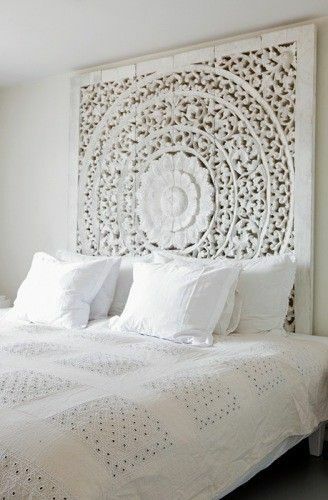 Create the look: source an old ornate mirror, lightly sand to key the surface and apply several coats of matt white paint. Lightly sand raised areas to create a distressed feel if desired. How beautiful do these vintage painted suitcases look? Once painted you can stack them to form a side table or use them as extra storage. Such a simple yet effective idea that would work brilliantly in shabby chic interiors. 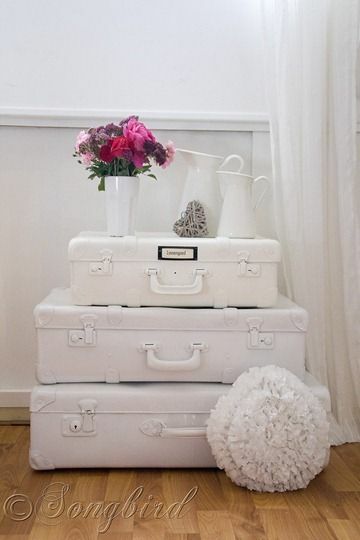 Create the look: all you need is a few old suitcases, primer and white paint. Take a look at the Songbird blog for step-by-step instructions. Take advantage of tall ceilings and make a statement with a large white pendant light. This oversized dandelion-clock (available from a very popular Scandinavian shop that’s big on meatballs), looks amazing in this bedroom decorated in various shades of grey. Create the look: shop for an oversized pendant light, old or new, or update your existing lampshade. The perfect solution for the DIY-shy. The trend for spelling out our style continues with oversized typography. 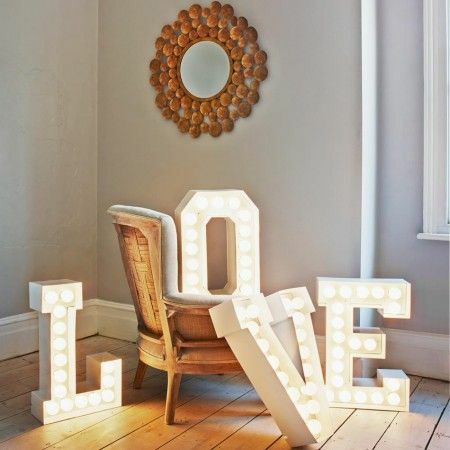 Whether it’s a modern take on vintage letter blocks complete with lights, or The Real McCoy, giant letters look great on the wall, mantelpiece or floor. Create the look: source vintage letter blocks and celebrate their authentic finish or give them a coat of white paint. Or head to your nearest home decor shop for a contemporary version.